Perhaps you've seen add-ons which add cars, jeeps, golf cars, motorcycles and bikes. Would you like to get a real tank? 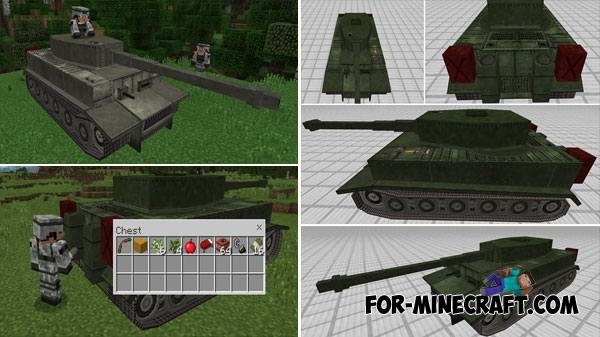 Yes, Tanks mod is 3 different tanks which are armed with a gun. Believe me, if you need a fighting vehicles then install this addon. Added a completely different tank. The new tank is a replica of a Tiger I which has new features, read below. Realistic appearance of the tank hides advanced features. So, now you can use the trunk accommodating 27 items. Items available at the time of control or you can get them being near the tank. Another feature is the multiple colors of the tank. All camouflage are in the archive, the choice is yours. Well, the last and the main feature is the ability to shoot missiles while in the tank. Open the inventory and take a new item replaces the usual egg. Ur aim can be anything, the missile destroys everything in its path. And of course, this Tanks mod supports a multiplayer mode of MCPE, so if you want to drive tanks together with friends then install your favorite tank and go. There are two tanks having the same characteristics and a different look. The first tank is ideal for woodland, and the second one is designed for the fighting in the desert. Both tanks are easy to use, you only have to get in and open fire. You will get tank shells which have a suitable form. Throw them in the enemy and it will be destroyed. Playing with a friend is the best feature of the Tanks mod. You need to install the modification and take one tank. Arrange a real war. Mine-Bikes mod v3 [Minecraft Pocket Edition 1.0.0/1.1.0]Yes, this is another transport mod for Minecraft PE but it has a small difference..
Jeeps mod for Minecraft PE 1.0.0/1.2We need more cars! And this is the addon that adds 16 multi-colored Jeep vehicles for any taste to the game.